We are excited to announce Parties That Cook’s B Corp Re-certification! As a certified B Corporation, Parties That Cook is committed to bettering the community through the events services we provide. First certified back in 2011, we still believe that businesses must create value for society, not just shareholders. Over 900 businesses have already joined the B Corp community, and we are proud to be a part of this network. 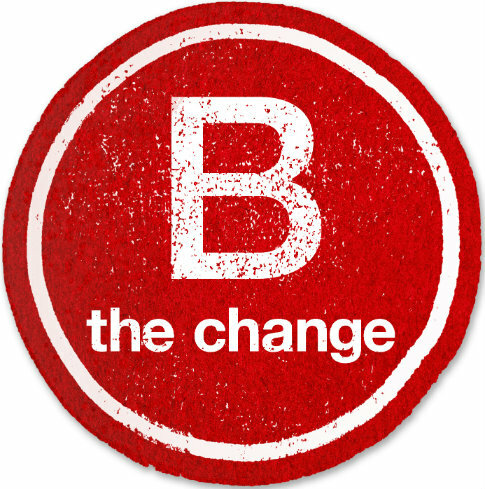 Why do B Corps matter? According to the B Corp website, “As a result of our collective success, individuals and communities will enjoy greater economic opportunity, society will address its most challenging environmental problems, and more people will find fulfillment by bringing their whole selves to work.” Companies are challenged not just to be the best in the world, but to be the best for the world. And this community of B Corp businesses is proving you can be successful while taking care of people and the planet. Now that’s something we can get behind. Marketing Intern Erin checking in, here. I’m really looking forward to this Friday, when I’ll get to work my first Chef’s Table event. Though this is mainly an opportunity for me to experience another event type first-hand, I’m intrigued as to how our more formal gatherings work. First of all, it’s important to note that Chef’s Table isn’t solely a corporate team building event. 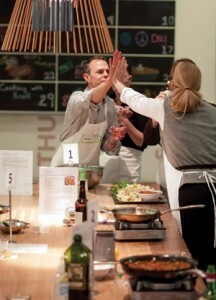 Rather, we encourage groups of coworkers, clients, family and friends to utilize this event to strengthen bonds. Parties That Cook events are rather ingenious because they cover such a wide variety of corporate and private event needs. 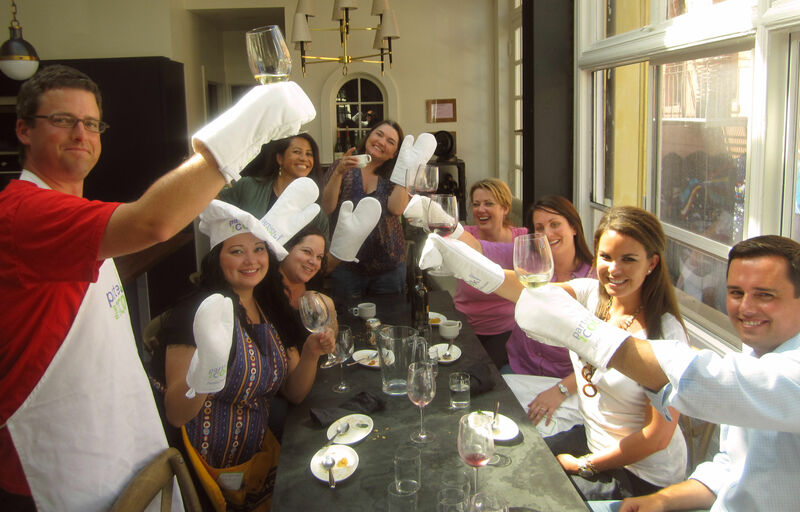 At Parties That Cook, we’re about building community, providing excellent service, and initiating fun interaction. How will this translate in a more formal setting, you say? Let’s see how we differentiate Chef’s Table from Sumptuous Small Plates while maintaining Parties That Cook’s core values! Upon arrival, attendees grab a name tag and mingle for a bit. Once the guests have settled in with a glass of wine and a bite from our antipasti platters, the lead chef begins a lively cooking demonstration. This is no boring lecture in a room of fidgeting people. 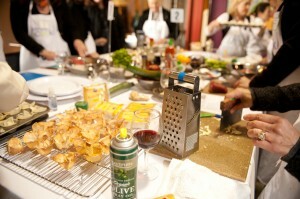 Guests are immersed in culinary tips and tricks, and even invited to drop some knowledge on the group, themselves. Bet you didn’t expect Bob from accounting to know how to the difference between a bulb and clove of garlic! Now that everyone’s all warmed up, the chef divides the group into teams to prepare different recipes from the themed, four-course Chef’s Table menu. Each delicious seasonal menu distinctly features a particular region of the world, and the exotic flavors that can be found there. Current menus feature recipes reminiscent of Italy, Mexico, and Southeast Asia. I, for one, think it’s impressive to know how to make authentic tortillas rather than grabbing some off supermarket shelves. And after sitting in on yesterday’s staff meeting, I know Chef Tanya is already working on next season’s menus. Don’t mind me as I drool in anticipation. Back to the event: As everyone cooks, chefs are right there with them to provide all the guidance teams might need. And I’m not talking about taking-over-the-kitchen “help”; think more along the lines of providing insider chopping techniques or genius fix-my-blunder hacks. The experience is YOURS, and our chefs are there to ensure that it’s a great one. How often do you get to interact with a professional chef, anyway?! Too cool. Now that the meal has been prepared, it’s time for my favorite part: Eating. No passing platters for you — all guests are invited to sit down and relax while PTC staff takes care of the rest. Our team buzzes around each table, filling glasses and serving the dishes of each course. Enjoy your masterpiece, reflect on the culinary journey that got you here, and bond with your fellow diners. Seems to me like you can have bake your cake, and eat it too!